If you've been desperately trying to restrain yourself from indulging in your favorite old-fashion recipes, check out our 21 Old-Fashioned Recipes Made Healthy! Don't let your diet stop you from diving into your grandmother's retro recipes. These delicious and tempting vintage recipes are most often foods that don't fit into our diet plan. Luckily, we've found ways to make these vintage recipes healthier for you. This means that you won't have to give up all of your favorite classics. 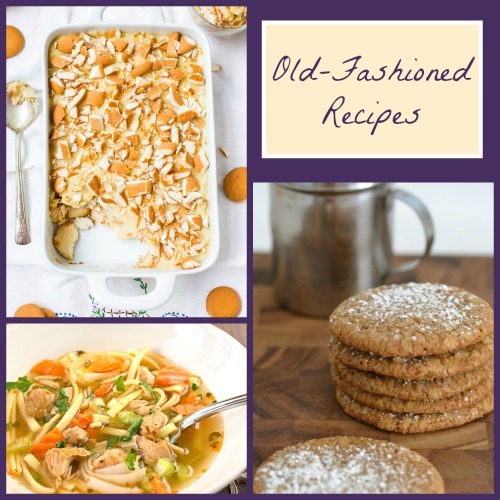 So, don't be afraid to try our old-fashioned meatloaf recipe or our old-fashioned chicken noodle soup recipe! Want even more healthy recipes? Check out these 11 Easy Soup and Stew Recipes! These soups and stews are classic favorites. They'll warm you up from the inside out. You'll want to make all of these simple healthy recipes! Don't miss out on your childhood favorite potato salad recipe! After making the German potato salad, you'll want to make all of the old-fashioned recipes listed below. With these side dishes, you'll make every meal amazing. Check out these healthy old-fashioned lunch and dinner recipes. They'll take you right back to your grandmother's kitchen! Now, you can share these recipes with your own family. Start reminiscing with this shoofly pie recipe and work your way down the list. All of these healthy dessert recipes will give you a blast to the past. You'll love that all of these desserts are delightfully delicious. For more great healthy cooking recipes, be sure to check out our collection of Low-Carb Recipes for a Healthy Lifestyle.